All transactions are safe and secure with a reliable history in online purchasing behind each of our associates. 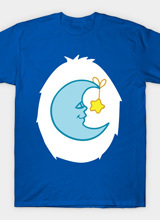 Buy the Bedtime Bear Costume t-shirt to own Care Bears clothing and merchandise. Ever wish you could step back in time and go to the eighties? I doubt I'm the only one who thinks about it, and I am guessing that this design will have you doing the same. This adorable Bedtime Bear Costume t-shirt will have you wishing that he guarded your bedroom door to make sure that you get eight hours of sleep every night. The logo is a reminder of Elena Kuckarik's inspiring original work that started it all. For more Care Bear merchandise that will remind you of the best decade ever, see the rest of the gallery. Don't miss the Care Bear costumes either. They are like totally rad! In addition to the Bedtime Bear Costume tee above, browse the Care Bears Clothing Gallery for more apparel like men's and women's clothes, kids shirts or hoodies.